Save up to $300 per line - $200 when you activate a new smartphone and we will buy back your old phone, guaranteed! PLUS - $100 instant credit on a new smartphone! $100 off any smartphone with a new Advance Pay activation! No contracts. No credit checks. 4G LTE Technology. Love your phone, but not your service provider? Bring your own device and get a $50 Instant Credit! *All devices must be unlocked and have the latest software available. Safety at a peace of mind price. Unlimited calling, text messaging and unlimited data (while on WiFi) for only $20 per month. *Contract buyout credit amount is dependent upon type of phone and contract term. BuyBack credit is dependent upon the type and condition of phone. 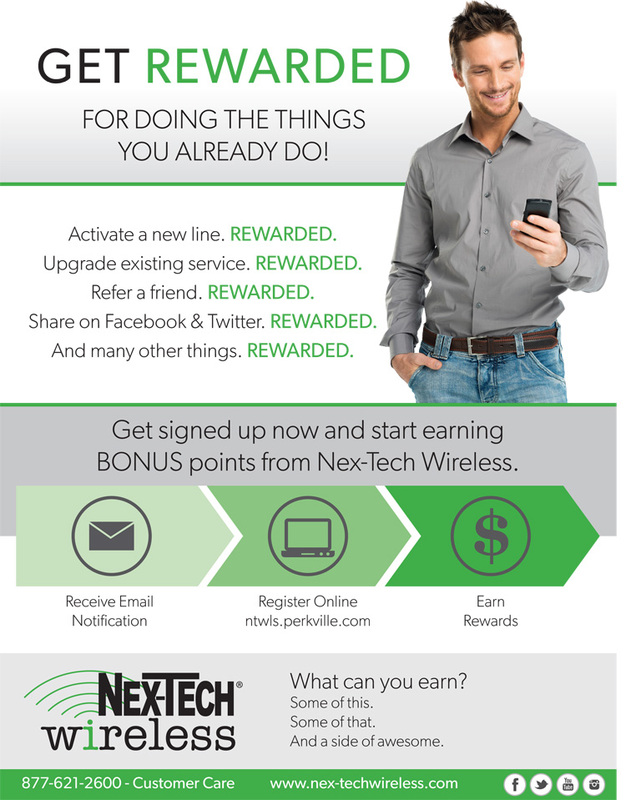 Customers must purchase a Nex-Tech Wireless device. This program is not available for Advance Pay. You can always have the latest and greatest phone! Sell your unwanted or unused devices and receive an account credit up to $300 per device! each receive 500 Perkville points! Get rewarded for doing things you already do! Activate a new line. REWARDED. Upgrade existing service. REWARDED. Refer a friend. REWARDED. Share on Facebook & Twitter. REWARDED. And many other things. REWARDED.